This could be the motto of Mainz, a city that is known for its personality. Mainz on the Rhine, just 30 minutes from Frankfurt, is one of Germany’s most friendly cities (in a country where they offer 'friendly' more often that those from outside think). It is a city that is definitely not afraid to be itself. What 'itself' means is that Mainz celebrates everything it celebrates (and it celebrates a lot) with passion, colour, music, playful use of the language, laughter – and the driest of satirical humour. Carnival in Mainz, or Fastnacht – Mainzer Fastnacht the German celebration of Carnival or Mardi Gras – is perhaps the ultimate reflection of this. 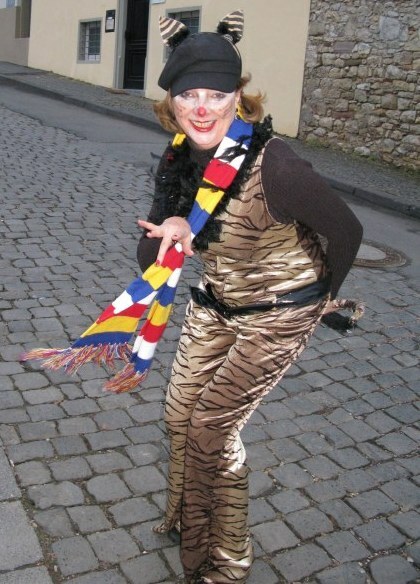 Fastnacht or Fasching is not known locally as the 5th Season for nothing, for it is a time when your clothes, habits, makeup and coiffure all reflect the season. It is a time when the shop windows and apartments, business and government buildings sport Fastnacht flags and colours. The bridge across the Rhine is flanked by the Fastnacht flag of the cities on either side – Mainz, the capital of Rheinland Palatinate – and Mainz Kastel that was allocated by the Americans to Wiesbaden after World War II, despite the clue being in its name about to which direction allegiance traditionally has lain. 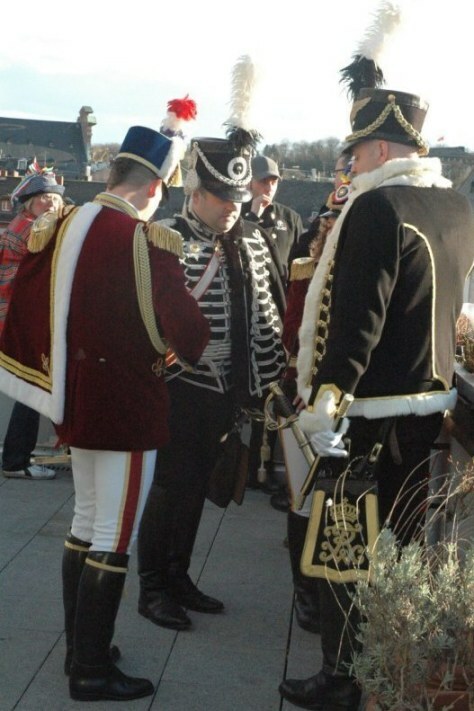 During this period, no matter what day of the week, anytime between 11th November and Shrove Tuesday you are likely to meet people in Napoleonic-era uniforms going about their daily business, or find a colourfully outfitted band marching through the city centre of the Old City. The most famous father of Mainz – Gutenberg (he of the invention of the printing press) even dons the much-favoured Carnival hat for the weekend of parades that culminate in the 5 or 6 hour-hour-long big parade on the Rose Monday, the Monday before Shrove Tuesday. The hat is a spoof of the Phrygian cap worn at the end of the Roman Empire in the western provinces to signify the pursuit of liberty and freedom. 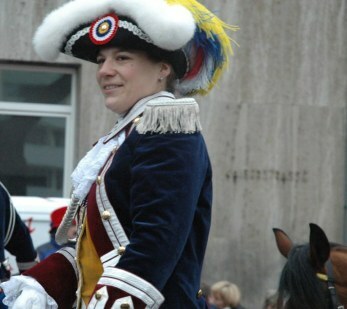 Given that after a long history dating back to the 13th century, the Carnival in Mainz came into its fullest strength to mock the occupying French forces of the early 19th century, the cap makes a wry statement. Mainz has always been seen as a strategic city along the Rhine and has been under French control more than once. The language reflects it, with words like 'Portmonnaie' for 'money purse', 'Trottoir' for 'footpath', 'Jalousie' for 'window blinds' and frequent use of the French pronunciation of 'Engagement'. I always enjoy hearing in the midst of a news broadcast the word 'Engagement' so perfectly pronounced in Parisian French in the middle of a German sentence. The spectacular and politically satirical Mainz Rosenmontag Parade has been filmed for TV news since 1910 and is now usually broadcast Germany-wide. 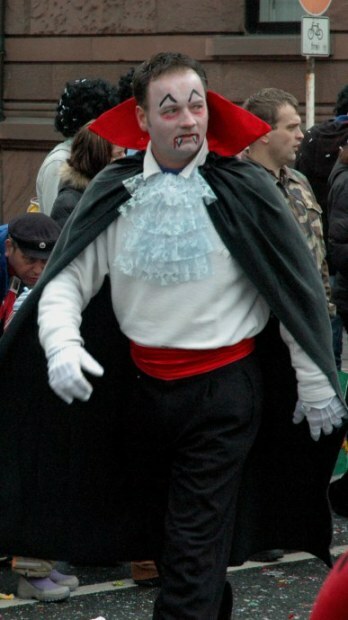 The only break in the tradition of carnival in Mainz was during, and shortly after the wars. 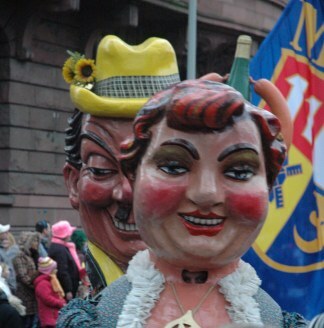 Earlier, the Nazis compelled the long-standing Mainz Carnival leader to stand down and all political statements were scripted by the National Socialists. After World War II there was no stomach for dancing in the streets or for military uniforms, and it was not until a much more sedate parade took place in 1950 that the whole Fastnacht tradition started to regain its previous satirical commentary on life, politics, and human frailty. The Prince and Princess of Mainz Carnival in 2012 met the Pope (reflecting the long-standing powerful role of Mainz in the Catholic bishop hierarchy, having retained its status over the centuries). This Fastnacht Prince and Princess came from the Ranzengarde, the oldest of the Mainz Carnival Gardes – celebrating 175 years of their existance. They also met the Chancellor, Agela Merkel – a symbolic acknowledgement of Mainz by the secular world. 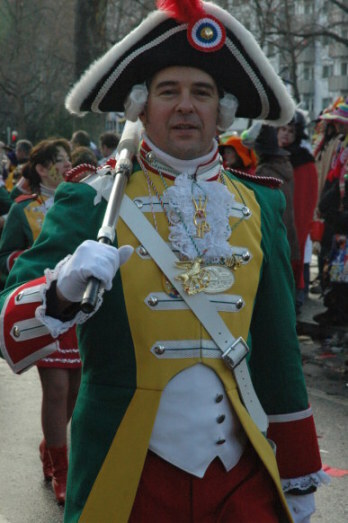 The uniforms of the various Gardes of the carnival in Mainz are modeled on those of Prussian or French Uniforms of the 1800s. At that time the parade was not yet so political and was carefully watched by the Ducal authorities to evaluate approvals for continuance that had to be issued yearly. 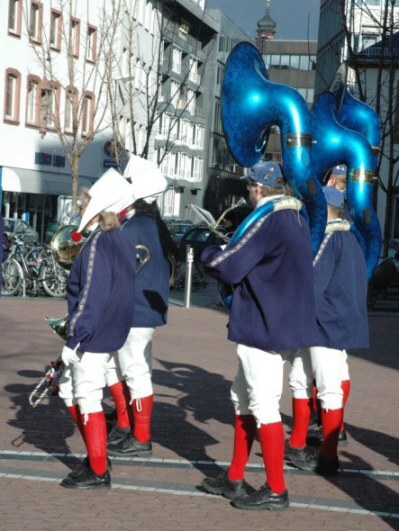 …the Mainzer Fastnacht Gardes reflect the attitude of the region and especially the city of Mainz. The cockade seen here on the hat, with its roundels of red, white and blue reflects those worn in red and blue during the storming of the Bastille. 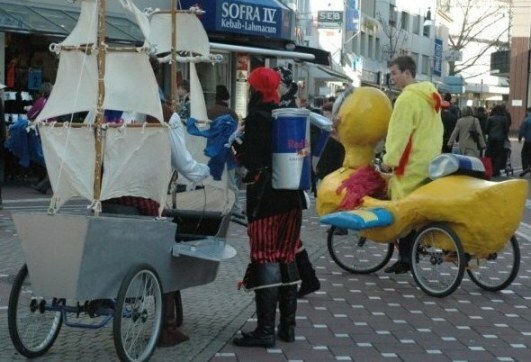 Another symbol of parody of the power of the occupying French forces was to wear it as part of a carnival costume. The roundel as it is now had the white added by Lafayette. At the same time a white stripe was added to the French flag to give wider association than that of the city of Paris, whose colours were red and blue. The roundel in its three colours was then adopted to be worn from the French militia. It was this roundel on French aircraft during the First World War that led to similar roundels being adopted by the forces of other countries during the Second World War. 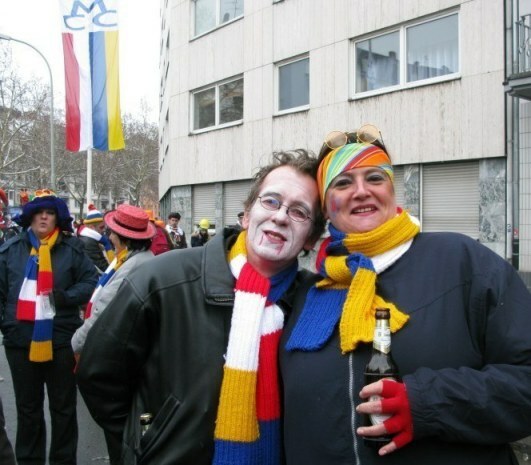 The Mainz Fastnacht flag is another parody – being essentially a replica of the French flag with an additional stripe of yellow – and being reflected in the scarves worn throughout Mainz during carnival season. 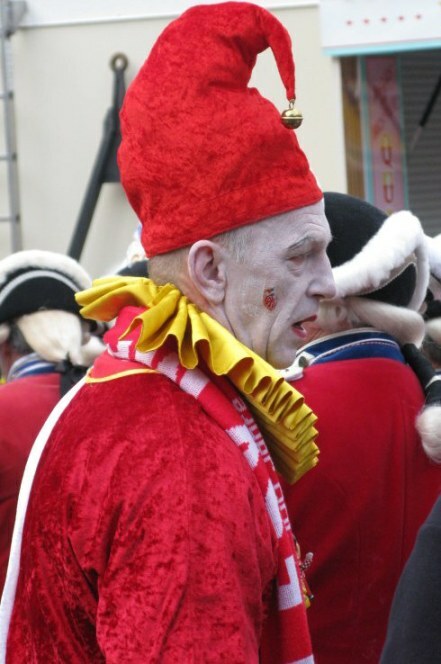 The 200,000 or so people who live in Mainz are passionate about their city, their festivals, their football team Mainz 05– and most of all about their Fastnacht carnival celebrations. 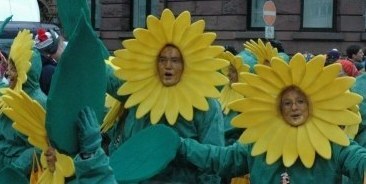 Mainz is known to be the “Political” Carnival of Germany. 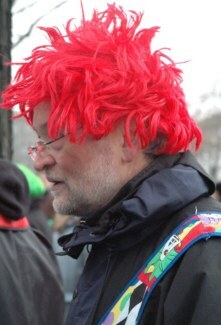 Political satire is the whole focus of the parade and of the many costume balls or 'Sitzungen' or 'sittings' that take place leading up to the final Rosenmontag Parade. These Sitzungen are a sort of satirical cabaret totally done in verse. They focus on the hot topics in politics locally and world-wide, and the personalities that feature within them. Having sat through a marvelous Sitzung with a hall filled with people all in costume, I was thoughtful afterwards. The young ballet dancers had practiced together for a year. So had the singing celler Masters – a barbershop-style harmonic that was compelling. The various bands had practiced every week, the choirs the same. People had got together to hone the verse till it was perfect and to add their bits of humour. The young lad of 12 who stood on the stage and gave a 20 minute verse satire had practiced intensely, for he had no notes. I was struck by the fact that what this moulds and adds colour to, is to something called 'community'. It saddened me to realise that in our English speaking world, it seems that more and more we don’t have time for things like this. For the most part, whether it be through or focus on material advancement (or survival) – or whether due to increasingly punitive laws that make a small festival almost impossible so that it is 'safe' - or whether due to all these, plus other reasons – we have lost what 'community' means. As in New Orleans, 'Community' is alive and well in Germany and bonded by music, song and verse. .. and on the other hand – if you are the person carrying one of the giant political 'heads' it is a physically demanding job. The enormous image sits on a strong frame cushioned on the shoulders of the bearer. 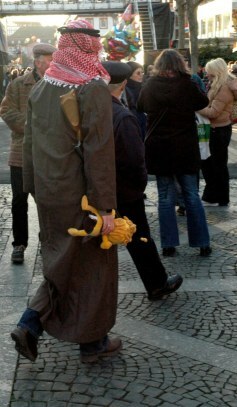 One of my colleagues – a Mainzer born and bred, carried a head during Fastnacht 2011 – and though a very sturdy chap, he said the balancing of that weight for the whole parade route was a hard job. He had known that before-hand, but felt it was something he could contribute or 'give back' in return for the privilege of living in such a great city, and all it had given to him in terms of fun, laughter, friendship and home-town pride. 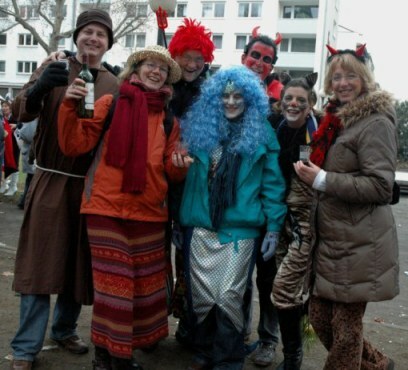 The big celebration of 'Elfter Elfter' - the eleventh of the eleventh which takes place at the 11th minute of the 11th hour of the 11th day of the 11th month, officially starts the Mainz Carnival season. The date pre-dates by some hundreds of years the same moment which starts the Remembrance Day memorials in other countries. 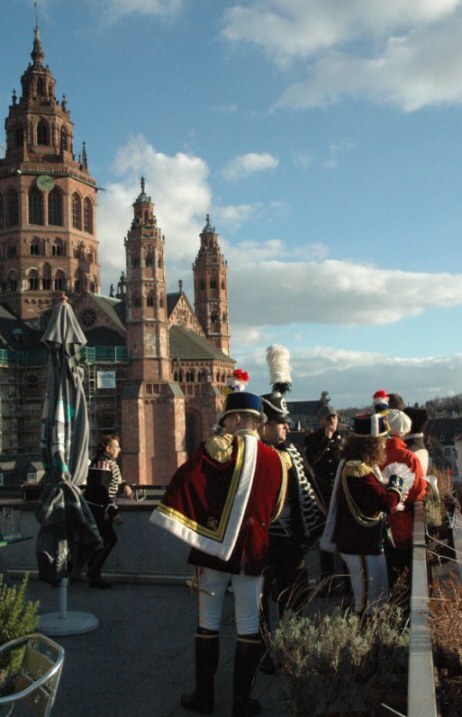 The date of November 11th in Mainz stems from ordinances over the holding of carnival parade. In ancient times a carnival association could only be legally designated for one year at a time – the date of such issuance being 11th November – and requiring renewal each year. 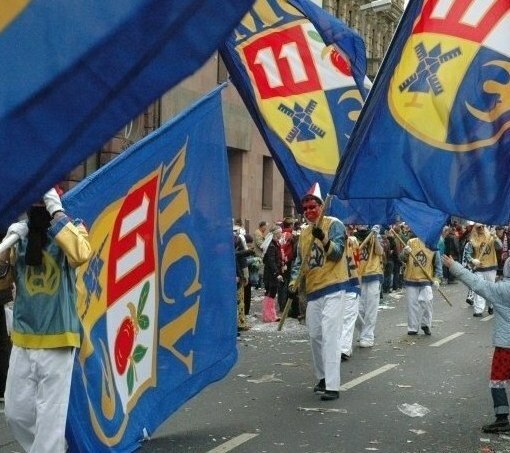 Even this is parodied by adding all the extra 11s to Garde regalia and in the flags of the Mainz Carnival Association Mainzer Carnival Verein– who have held just such a charter on behalf of the city from 1838 onwards. Since then, the structure of the big Rosenmontag 'Rose Monday' celebrations hasn’t changed greatly. One recent addition has been that of going to the Dom, or cathedral, for mass on Fastnachts Sunday morning – in costume. It is a sight to behold to see the huge Mainz Dom or Cathedral packed with about 2000 people all in costume or Garde Uniform. In this photo I believe the effects of a long night of celebration shows in my eyes and I was glad to be able to keep warm with my Carnival scarf. There is something quintessentially Mainz to be in a Cathedral during mass and to hear the bells of the Jester Bajass with his lantern, jingling whenever he moves. Most people who attend are a bit left over from the celebrations of the night before. I know this was the case for me on the first time I went to the Fastnachts Sunday Mass at the Cathedral. It was just two and bit hours of sleep from getting to worship from a long period of 'whiskey, wine and wild, wild women' (to corrupt a well-known phrase). 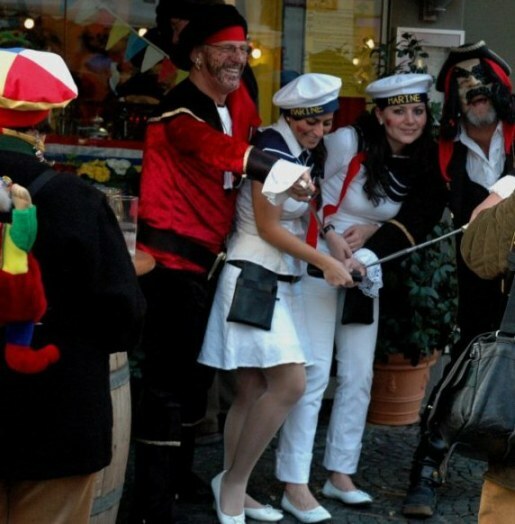 For the Mainzer, the resident of Mainz, Fastnacht, the Mainz Carnival, is a time of getting silly with your friends. …or just making some sort of composite theme. 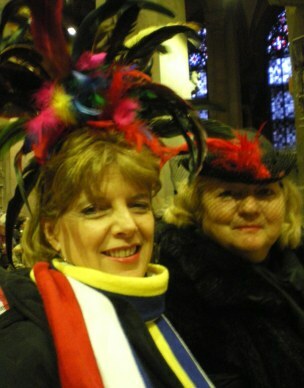 …and of doing your shopping in costume in the city and meeting bands along the way. 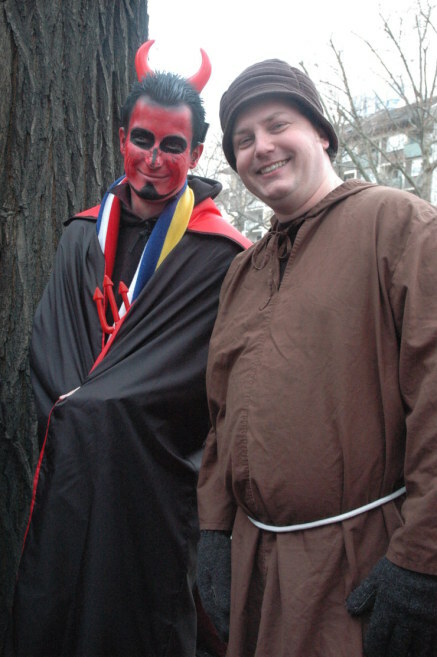 It’s a time when the lines between the holy and the unholy grow fuzzy and a monk can meet happily with the devil. …and see what prey you can capture. 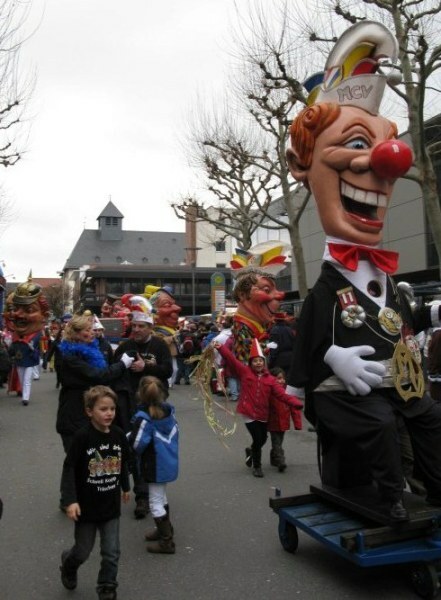 Most of all, Fastnacht in Mainz is a time where…in the words of one of the Fastnacht songs 'keiner ist allien' - no one is alone. …and meet new friends by sharing the experience. 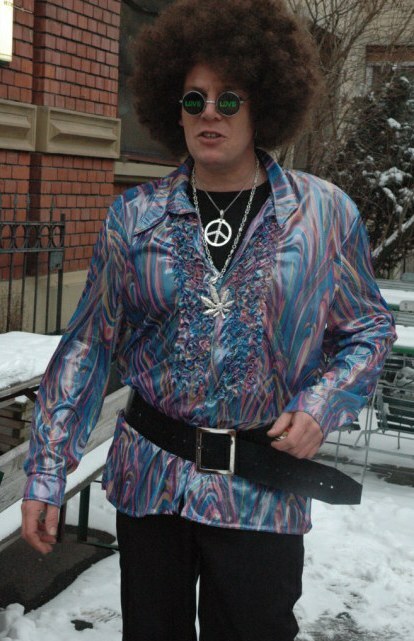 …or your local favourite bar owner dressed for flower power. 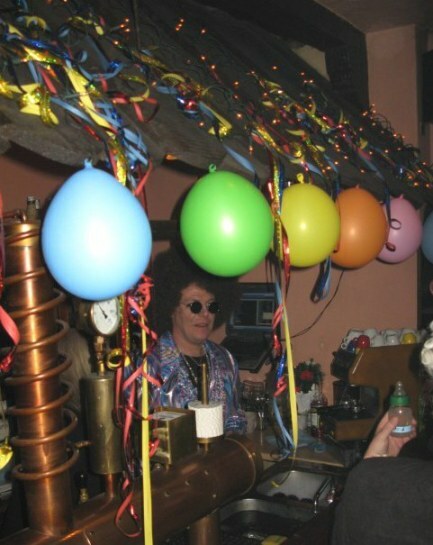 …bars that which will be decorated for Fastnacht – Carnival – the fifth season of the Mainz year. In Mainz, Germany’s most political Carnival is also a celebration of friendship, of the continuity of community and its history, and of immense local home-town pride. It is also a celebration of the language, for everything is read in verse – and all the placards in the parade are also in rhyme. 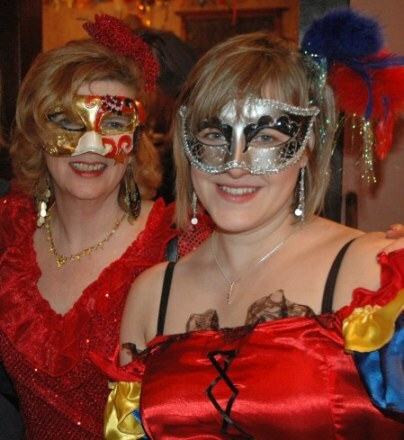 ‘Fasching’ , ‘Fastnacht’, ‘Karneval’, ‘Carnival’ or 'Mardi Gras': by whatever name – once you have celebrated the event in this city of fun-filled people it will always be reflected in your memories. This is a city where the radio weather report on Fastnacht Sunday clearly stated it would be clear on Monday, a bit colder Tuesday and “Es ist egal” on Wednesday. There is no actually correct translation of "es ist egal" to English, but closest would be "it doesn't matter." In other words – as it says in the popular Fastnachts song “Am Aschermittwoch ist alles vorbei” or on Ash Wednesday everything must be given up anyway – so who cares what the weather will be! On the other hand there are many who find all this nonsense - well – nonsensical - and as it is hard to ignore the final exuberance of Fastnacht celebrations, leave town. They, too are entitled to enjoy their wonderful city in ways meaningful to them, just as everyone has different religious beliefs.